Try as I might, I’m struggling to find a shift pattern decal for my R700. It is a1976 model (Aussie) and has the TRTXL107 Maxitorque gearbox. It’s the Direct gearbox, not the later model overdrive one. I’m trying to find a shift pattern decal for it. So far, I have only found ones for the overdrive box. Any ideas folks? thumperdyne commented on thumperdyne's gallery image in BMT Member's Gallery - Click here to view our member's albums! thumperdyne added images to a gallery album in BMT Member's Gallery - Click here to view our member's albums! Yes Jeffro..That was "The Spirit of Adventure II" . 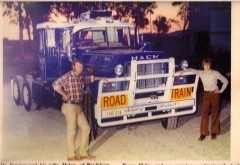 Dad's first Mack was a R685RS which was traded in on the R797RS. I believe the R700 was being used around Brisbane in recent years, so I have the feelers out to see if indeed she still exists. I have many photos of it but my favourite is the pic in the Bulldog Bulletin which I will try and scan and put on the site here.